What Is The Air Conditioner Compressor? When Should You Have The AC Compressor Replaced? What Is Done During An AC Compressor Replacement? Issues with the AC unit can be one of the more expensive repairs you’ll need to make to your car, depending on what the exact issue is. One of the most common issues is with the AC compressor, which works at the heart of the air conditioning unit and has several moving parts which can become faulty. Fortunately, fixing an AC compressor costs less than having these individual parts fixed or replaced so most garages will simply install a new unit rather than attempting complex repairs. The cost of an AC compressor unit can range from $195 to $736 for the part itself, while the cost for parts and labor can be between $376 to $986. This will depend on the model of car and how much work is involved in the repair, with some units being substantially more difficult to replace than others. The AC compressor replacement cost will vary depending on the model of car you drive, where you have it repaired and what kind of part you require. There will be substantial differences depending on what garage you go to and if you opt for aftermarket parts. Unlike some components, going with an off-brand AC compressor shouldn’t cause any issues with the functionality of your air conditioning unit. The air conditioning system is comprised of several components, such as the condenser, evaporator and the compressor. The AC compressor is one of the most important parts in the system, working like a pump to take the refrigerant, compress it and pass it on to the evaporator. The compressor itself contains several moving parts, and these parts can often fail and cause the compressor to stop working. If these parts come apart they can disperse, causing debris to spread throughout the air conditioning system. When replacing the AC compressor, most garages will look to replace the receiver dryer and the orifice tube as well, as there is a risk there will be debris in those areas. The clutch, bearing and electrical connector are essential for the AC compressor to work properly. 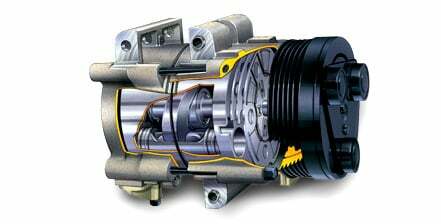 A drive belt powers the clutch, which works to engage the compressor when the air conditioning in the car is switched on. If either of these components fail, the recommended practice is to replace the full compressor. This is often the most practical and the more cost-effective approach. Another common fault with the AC compressor is the seals, which are prone to going bad. If the compressor starts to leak AC oil or refrigerant it can affect the seals, at which point the full compressor will need to be replaced as these seals cannot be replaced. A fully functioning air conditioning system can be anywhere between a pleasant luxury and an absolute necessity, depending on the climate where you live. While in the past you were limited to opening the windows and just dealing with the wind and noise, over 80% of new cars are now fitted with air conditioning. The AC Compressor replacement cost is minimal compared to the amount of comfort and solace that a nice cool can provide on a hot summer day. It allows you to maintain a comfortable temperature in the car, even in the warmest of climates. Most people with kids will be aware that there’s few things like a hot car to start an argument between siblings, so cool air can often mean cool heads! On a practical level, functioning air conditioning can keep the windscreen and other windows clear and free from mist. This can help significantly with visibility, particularly if you have a car full of people misting up the windows. Finally, having the windows of a car can have an influence on the aerodynamics of a car. Keeping the windows up ensures this remains at an optimal level, reducing fuel waste and keeping noise to a minimum. There are various common symptoms that there may be an issue with your air conditioner compressor. The first and most obvious sign is that the air conditioning itself isn’t working properly, with little to no cool air coming out of the vents. Your local garage should be able to diagnose the fault for you, and isolate which component is causing the problem. Sometimes you’ll find the vents are blowing hot air but not cool – again this could be an issue with the compressor so have it checked out. Another common symptom is a clicking noise coming from the engine. If the AC isn’t being used regularly the seals and components can dry up as a result of insufficient lubrication. This can result in a loud clicking sound as the unit tries to function, which can lead to poor results from the AC unit. If you notice any unusual sounds coming from your engine, be sure to have it inspected. When you take your car to the garage with a suspected AC compressor issue, the mechanic will perform a few diagnostic tests. They’ll check the overall pressure of the AC system, before checking for power and ground at the compressor itself. If they find the compressor to be faulty, the first step is the removal of all the refrigerant in the system. They will then remove the compressor, orifice tube, receiver drier and the expansion value to allow any debris and foreign material to be flushed from the system. The new compressor will then be fitted, alongside the new orifice tube and receiver dryer if required. The AC system will then be evacuated and recharged, before checking for any possible leaks in the system. If the installation appears to have gone well, they will test the full operation of the system to ensure full functionality has been restored. As with most auto repair, you can usually save some money by ordering the parts online and performing the repairs yourself. Online parts retailers like NAPA, Walmart and Amazon mean consumers have access to car components far more readily than ever before, so if you do your research and feel comfortable working with your hands you can fix a lot of common problems. If you’ve had the fault diagnosed as an issue with the AC compressor, the unit is fairly straightforward to remove (see the video below). The main challenge for an amateur mechanic is the removal of the refrigerant – not many people have access to the machine which performs this task. If you’re determined to do this work yourself, find a mechanic willing to drain the refrigerant for you, then finish the job yourself. The other way is to simply shop around for the best possible price for the work. You can compare rough costs for parts and labor online, and you can get several quotes by just calling around local garages for an estimate. While it’s worthwhile going for a low price, be sure to go with someone you trust or who has a good reputation. We’ve compiled a list of common costs for both parts and labor for some of the most popular car models in the country. While the actual cost will vary from place to place, these should give you a rough idea of what you can expect to pay to have your AC compressor replaced.